1. Kingfishers (family Alcedinidae) and the allied families of todies (family Todidae) and motmots (family Momotidae) in the suborder Alcedines. 2. Bee-eaters (family Meropidae) alone in the suborder Meropes. 3. Rollers (family Coraciidae) alone in the suborder Coracii. 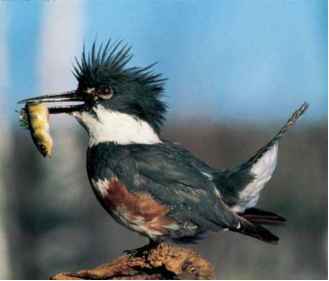 The allied families of ground-rollers (family Brachypteraciidae) and the anomalous cuckoo-roller or courol (family Leptosomidae) are commonly included as Coracii in other treatments. 4. 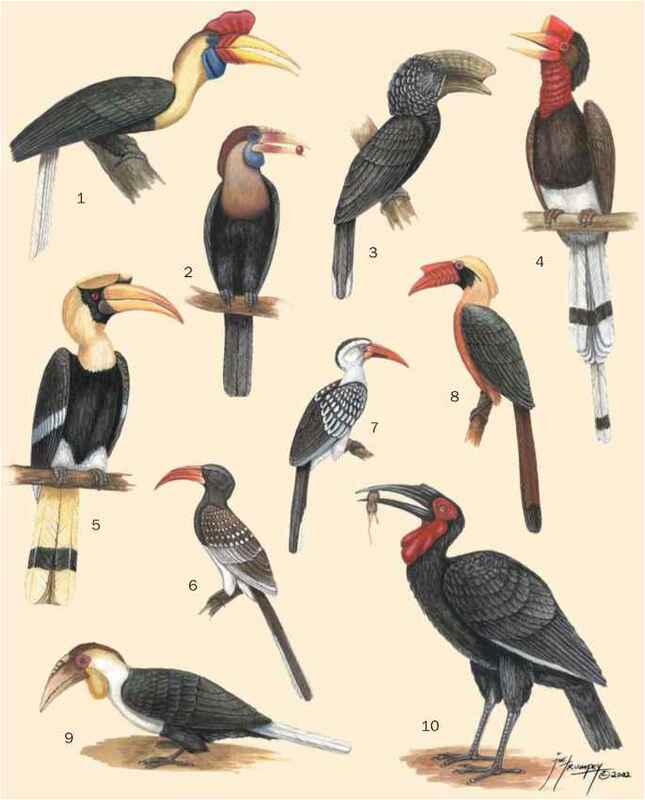 Hornbills (family Bucerotidae) and the closely related common hoopoe (family Upupidae) and woodhoopoes (family Phoeniculidae) in the suborder Bucerotes. Given the diversity of the order, other arrangements of the Coraciiformes have been proposed. On the one hand, some other families have been proposed for membership to a wider and more inclusive order Coraciiformes, such as the trogons (family Trogonidae), jacamars (family Galbulidae), and puff-birds (family Bucconidae). Of these, the trogons, with their worldwide and tropical distribution, are prime contenders for inclusion; although they differ in the unique heterodactyl arrangement of their toes, they are similar to other Coraci-iformes in many other features. On the other hand, several coraciiform families have been elevated to the level of an order, such as the todies, hornbills, and hoopoes, while several subfamilies have been elevated to the level of families, such as the kingfishers, hoopoes, and hornbills. More distant relatives of Coraciiformes have been proposed to occur mainly among the woodpeckers and barbets, and especially the jaca-mars and puffbirds, of the Piciformes, but also among the tro-gons of the Trogoniformes, the cuckoos of the Cuculiformes, and the mousebirds of the Coliiformes. The rollers sensu lato have also been proposed as the primitive evolutionary template that gave rise to the sub-oscines, such as broadbills and pittas. All of these orders have been proposed to be precursors to the great avian order of the oscine Passeriformes, a suggestion based in part on the different and possibly relict forms that are now isolated on Madagascar. ordinal divisions above and supported by some of the characteristics listed above and below. The common hoopoe and woodhoopoes are related by the unique anvil-shaped bone of the inner ear bone, while their most similar relatives, also with oval eggs and pitted shells, appear to be hornbills, which are defined by their uniquely fused neck vertebrae, the atlas and axis. The two special New World families of todies and mot-mots, as might be expected from their distribution, appear to be each other's closest relatives. These families are linked by species of intermediate characteristics, such as the tody mot-mot (Hylomanes momotula), and the connection is supported by a useful fossil record that shows an earlier and wider diversity in the Northern Hemisphere. Their biology also supports a more distant link with either the kingfishers, reflected in the diminutive kingfisher-like form of some todies and inclusion in the suborder Alcidines, or the bee-eaters, alone in their suborder Meropes but linked by the heavy bee-eater-like bill and the behavior of the larger motmots. It is notable that most members of these last four families excavate their own nests as tunnels into the ground, termite nests, or epiphyte roots, while only a minority of members use natural tree or ground holes. They all share the stirrup-shaped inner ear bone, together with trogons, and they all have chicks with well-developed pads on the "heels."